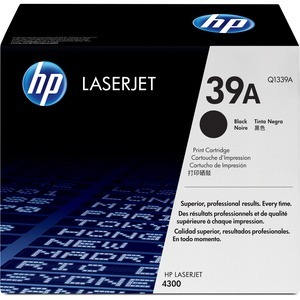 Print cartridge is designed for use with the Hewlett-Packard LaserJet 4300 Series. Cartridge yields approximately 18,000 pages. Advanced toner formulation and cartridge design complement technology in the HP LaserJet 4300 printing system to ensure a new level of print quality consistently over the life of the supply and from cartridge to cartridge. HP printing supplies features make HP LaserJet Q1339A print cartridges very easy to order, install, manage and maintain. These supplies offer an added measure of control and convenience to everyone in the office. HP LaserJet Q1339A print cartridges offer higher capacity and increased yields for economical use as well as a time saving design and proven-reliable operation, all designed to reduce total cost of ownership.